For one office products reseller (A) it's quite possible to be feeling upbeat about the business prospects and for another (B), it's quite possible to be feeling pretty beat-up and pessimistic about the future. The same industry and the same business model but opposite ends of the spectrum. And, based on what I hear, there's more feeling pessimistic about the outlook than optimistic. Why is this? 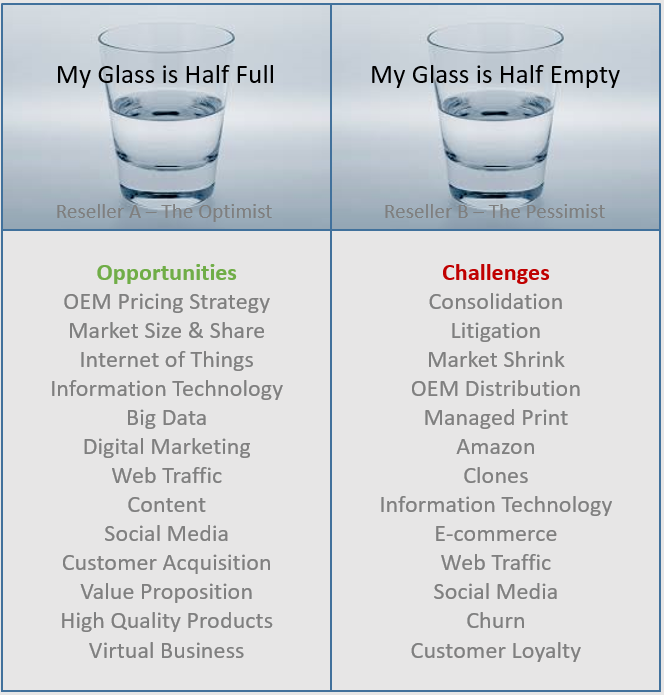 For the "glass half-full" guys who see the opportunity to take a piece of a $20B growth opportunity and, working diligently to convert customers and prospects off of high priced OEM cartridges into high quality aftermarket products, things must feel pretty good. For the "glass half-empty" guys, constantly being beat up with the online pricing particularly from the Amazon marketplace, a shrinking market and high churn rates, things couldn't look much worse. After 25+ years of hard work, maybe it's time to pack-up and give-up. People say there are still 5,000 or more independent resellers in the office products and equipment industry in the United States. Who knows if that number is accurate but, regardless, I think we can safely say there's a large number. So, why is the prevailing mood one of pessimism and uncertainty? Is there reason for optimism and should resellers, who may be on the verge of quitting, be thinking differently or not? Why would there be such a divergence in the outlook of Resellers A and B? If you scan the list of opportunities that Reseller A faces every day and compare with the list of challenges faced by Reseller B, half of them are the same. Many times, what Reseller A views as an opportunity Reseller B views as a challenge. Let's go back a minute and recap the origins of the remanufacturing industry and the personas of the individuals that built the industry. In their wildest dreams do you think the OEMs ever thought they'd be competing with remanufactured cartridges? You can bet your life they didn't! They created their razor and razor blade model, protected the hugely profitable cartridges with a thicket of patents and pressed the start button! Well, out of that scenario came hundreds, and then thousands, of entrepreneurs that scoured their local market for empty cores, leveraged the "green" theme, rebuilt and resold them at a lower price than the new OEM cartridges. It wasn't difficult to present a value proposition - after all the OEM cartridges were (and continue to be) priced at such outrageously high levels, it's been an open invitation for the competition to materialize, and so it did. Now, think for a moment about the persona of the typical individual that entered the aftermarket for ink and toner cartridges 30 years ago and the digital transformation challenges faced. What was the skill set required? Firstly, you had to be an entrepreneur, secondly you had to be willing to go out and talk to potential customers, get their empties and then to go back and sell them a remanufactured cartridge, so for sure you had to be a salesman! Finally, you had to be a bit of a techie - disassembling, refilling, reassembling, and testing of ink and toner cartridges. There weren't too many manuals on "how-to-do" in the early days and it took a special persona to handle this diverse set of requirements. Now let's fast forward 30 years to the current day and the skill set that's now required. First, of course, the entrepreneurial mindset remains vital. Second, the personality and sales capability is no less important but, third, those techie skills are really not needed any more. Rebuilding cartridges in a local workshop should be (if it isn't already) a thing of the past. It's simply not possible to deal with the technical and quality issues involved with today's high tech and numerous cartridge styles. Long gone are the days of one dominant cartridge (SX) in the marketplace and one dominant OEM (HP). So, the mechanical challenges of disassembly and reassembly have become an obsolete part of the resellers persona, and there's a new requirement that's come into play. This new requirement is the internet and the mastering of digital skills necessary to compete in the new environment. Unfortunately, the makeup of the original persona is not well-equipped with all the necessary skills for today's market. That old "techie" skill set has to go out the window and must be replaced with a new "digital" skill set. That means retraining an old mind, one that's likely to have some difficulty getting round the difference between (for example) the Kardashian family social media tactics and those required for an office products reseller to be successful! It took three skill sets to get started - it's going to take three to continue - it's just that one has changed! The reality of today's market is very different from the one that existed 30 years ago. The technical and intellectual property challenges have been massive but, over the years, the aftermarket manufacturers have responded. Today, the reseller has never been better positioned to present a compelling value proposition, especially when compared to those early pioneering days. Resellers should be crushing the OEMs and the big-box retailers, who have no room to move on pricing if forced to defend existing market shares in the face of high quality competition from the independent reseller channel. 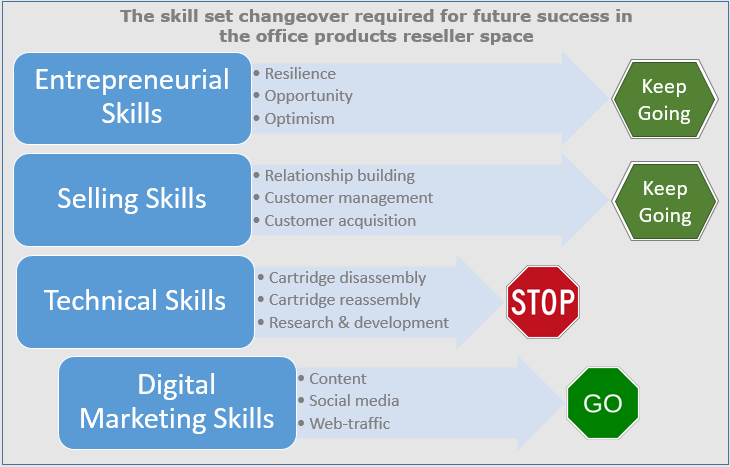 There's a small emerging group of office products resellers starting to understand the path to a successful digital and business transformation. These are the ones, while still a minority, who are learning how to see the challenges as opportunities. They are leaving their remanufacturing roots behind, rebuilding the enthusiasm, resilience and optimism necessary for all successful entrepreneurs, and positioning their businesses for profitable growth.